So I woke up Friday morning with a “lovely” little patch of poison ivy rash on my face. I don’t know how I got it but it’s there. Normally this would cause my OCD to go into overdrive but I’m working on taking it in stride. So there is a small cluster of the red hot itchy blisters on my thumb, two sections on my face (probably from the spot on my thumb) and it’s been slowly spreading out to other places (my side, arm, leg, etc). Poison ivy is probably the number 1 reason I hate being outside. Yesterday morning I woke up and felt terrible. this wasn’t good because I had a celebration I was attending and photographing. I remembered that I had just purchased some Dickenson Witch Hazel from Walmart the other day to use once my current toner runs out. I remembered reading on the bottle that it temporarily relieves minor skin irritations due to: Minor cuts — Minor scrapes — Insect bites. Now I don’t know about minor but poison ivy is definately a skin irritation. 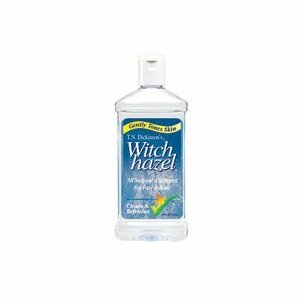 15 Wonderful Uses for Witch Hazel. Gotta say I’m impressed. Oh my! what a mess! 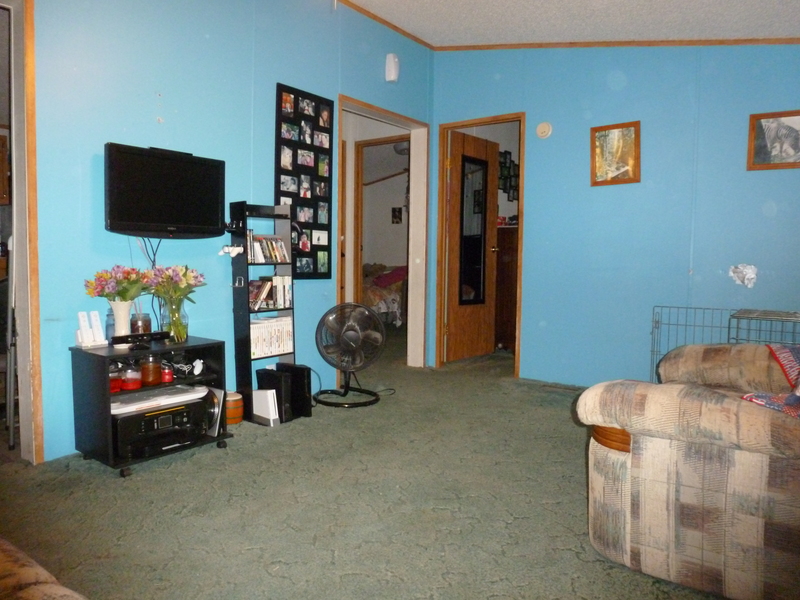 Oh my goodness – i just found my before pictures for the family room! I’m so glad that I took them because we have come a long, long way. Not ready to post them just yet but will definately be posting them as a before and after post. Definately a nightmare. Yard Sale is 11 days away! Man, time is ticking away fast. Only 11 more days before this yard sale. Feels like not enough time before this “magical” day where my wallet will be fatter and my house lighter. My daughter and I went through her toy box, stuffed animal net and dress up clothes today. 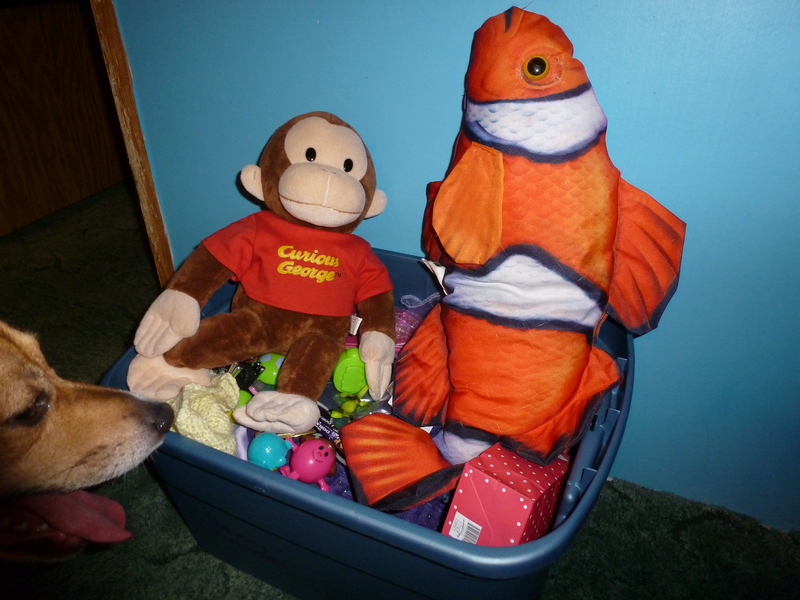 She was able to fill a small tote with items for the sale. I think she is finally starting to see that when there is less STUFF there is more opportunities for play. It’s also easier to pick up and put away. It becomes easier and easier. Here are the items that we’ve pulled aside for the yard sale since May. 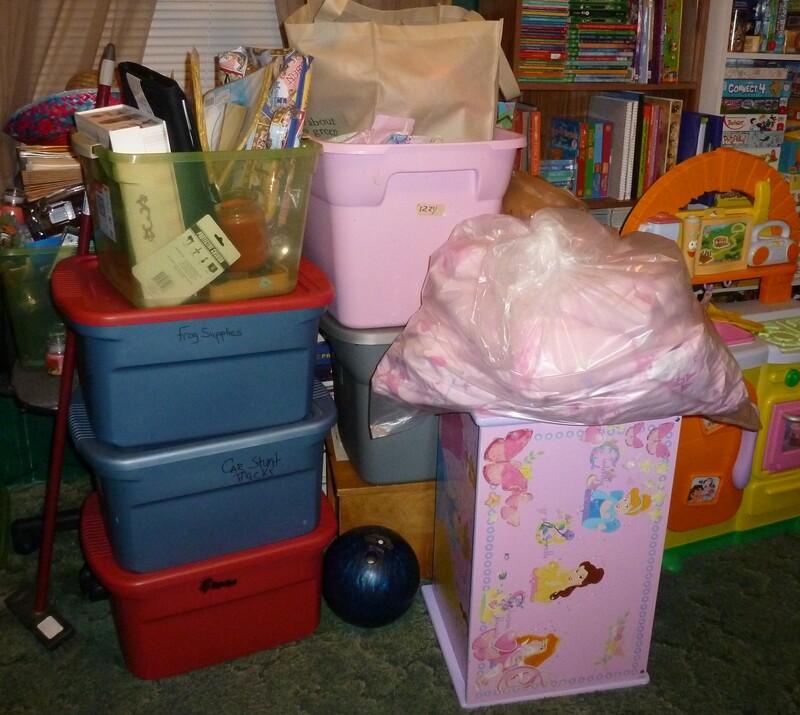 (all the yard sale stuff collection before April 30 is out in the shed already). A small glimpse into the nightmare known as my family room. The books and games on the shelves are not for sale but everything else pictured is going out on June 2. I’m so excited. Race car tracks, her dress up trunk, the kitchen set, and quite a bit more. I purchased two under the bed totes for my daughter that will create limits – one tote for her dress up items and one tote for doll clothes. She likes the totes and likes how easy it is for her to get to them. She also agreed to the set limits (once the tote is full something has to go before new can come in). I used to be so opposed to anything being under the beds. You might not have been able to walk through the room but by golly the space under the bed would be free. 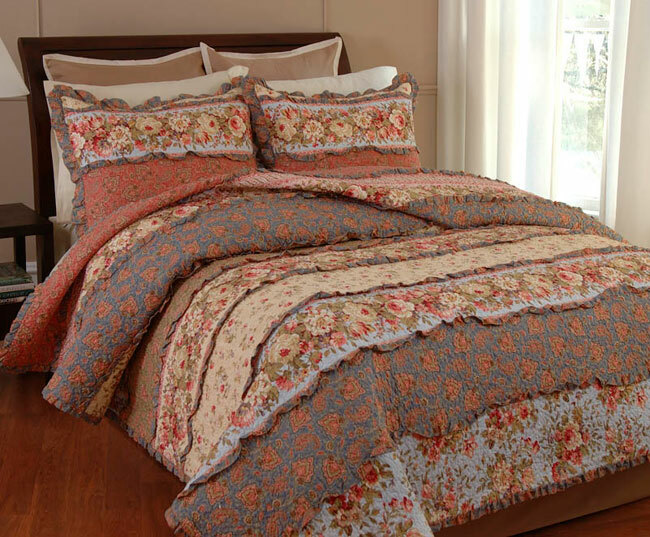 We have two totes under our bed – one for our linen and one for our daughter’s linen. I was so opposed to this but it really helps. If the sheets don’t fit in the totes then we have too much. The totes also keep the linen clean and dust free until we need to change the sheets (our house gets dusty really fast). I wish that the blankets would fit in them but it’s not quite big enough so a small laundry basket is in our closet with our extra blankets. I’m tired of telling her no. It’s been so difficult though because she had (has) so much stuff that she struggled with putting it away so the mess would be in every room and it would be so overwhelming. It’s gotten so much easier as we’ve been decluttering. I also have her help set up where the items go so she remembers. Months ago my husband bought me the plant stands below. I was very confused as to why he would buy these for me since I really don’t like dirt but when I asked him he stated that they were on clearance and really cheap. I finally decided that if we were going to keep these plant stands that they needed plants on them so the other day I went to Walmart and bought these 9 bright red pots and today I bought a rather large bag of dirt. The back of our house is yucky and gross and I rarely ever go back there. The ground looks dead and my husband has yet to clean the siding so it’s a little funky (he takes care of the outside and I take care of the inside of the home). My daughter and I filled the 9 bright red pots today full of dirt and seeds. I thought that if I put the pots back where it was yucky and gross that once they start to bloom it wouldn’t feel so bad back there. Maybe we’ll even want to take care of it back there. planted are poppies, catnip, assorted herbs, wildflowers, perenial mix, marigolds, nasturtiums. It’ll be bright and colorful. Our dog really enjoyed being outside with us as well. The second thing that brings happiness to my day is doing laundry with the homemade laundry soap that I actually made a few weeks ago. It smells fantastic, my clothes are bright and clean and it costed very little. If you’re interested I have the figures for how much it costed me. I used Fels Naptha instead of the Zote because Walmart didn’t carry it. I also used Sun Oxygen Cleaner (walmart brand) instead of Oxi Clean because of the huge difference in price. We went with the Fresh Spring Waters scent for the Purex Crystals Fabric Softner (daughter’s choice). It’s lasting forever and it works. 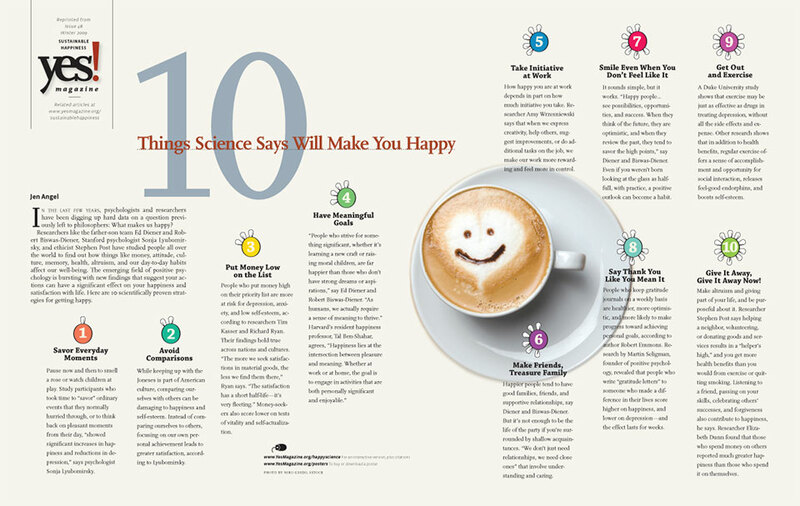 Happiness abounds. 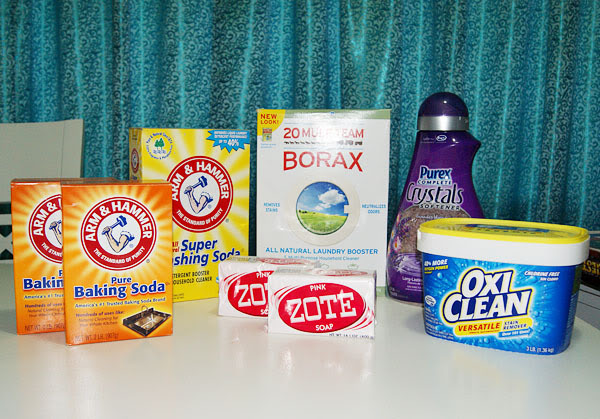 I’m also super excited about trying vinegar and baking soda to do most of the cleaning around the house. It works great (especially in the bathroom and kitchen) and is less harmful then all of the other chemicals I used to use. I’ve always been fasinated by people who are minimalists. If you’ve read any of my blog you’ll know that I’m more of a hoarder than minimalist but I have the desire to downsize. Just out of shear curiousity I decided to count the number of items in my living room (in a non-compulsory, imperfect way). I’ve worked really hard in my living room and have gotten it to a place where I am comfortable in it. We’ve gotten rid of tons of stuff from this room. It feels open and usable which is the way a living room should feel. I did not count the little area that is just off of the living room though it may be considered part of the room? I don’t know. What I found interesting is that there is a large number of items on the walls alone. Including the two smoke alarms, the blinds and the curtain rod (no curtains) there are 20 items on the walls. There are 13 picture frames on the wall. It really doesn’t feel like that many items are hanging up. (TV is also hanging up – did not count the wall mount or the cords). There is 6 pieces of furniture in my living room though it does not feel like this much. There is the couch and recliner. 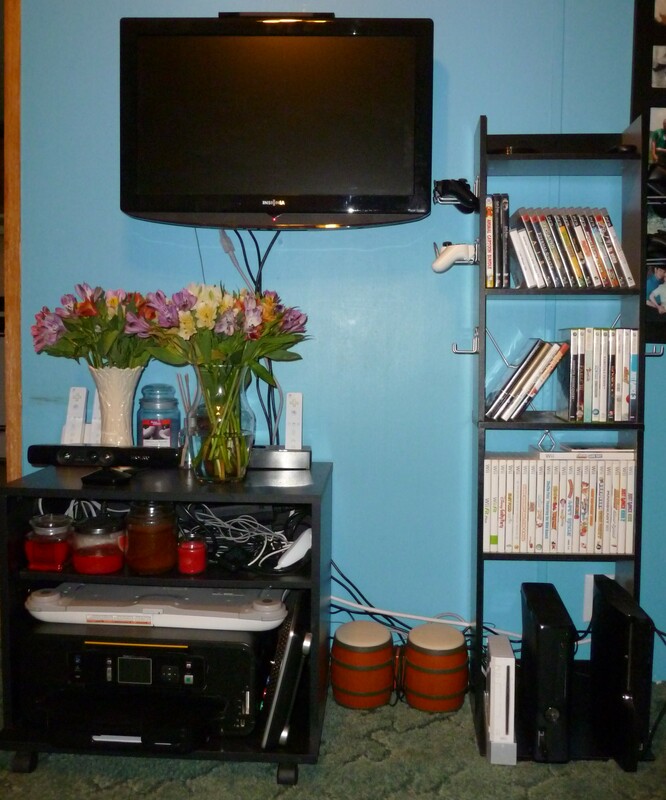 There is also the gaming shelves and the television stand that doesn’t have a television on it. Behind the couch is a folding table that we use instead of a coffee table (we started out with two coffee tables in this room – both gifts). Behind the recliner is a folding child’s chair that my daughter loves. The picture looks cluttered I know but it works for us right now. Here is where the majority of our items are in our living room. 18 items for the game systems (if you count assorted cords as one item), 48 games combined for the systems, an all in one printer. a tv remote, 3 movies in their cases and then a small pile of dvds without cases, the two vases with my anniversary flowers and 6 candles (down from over 30 when I started). 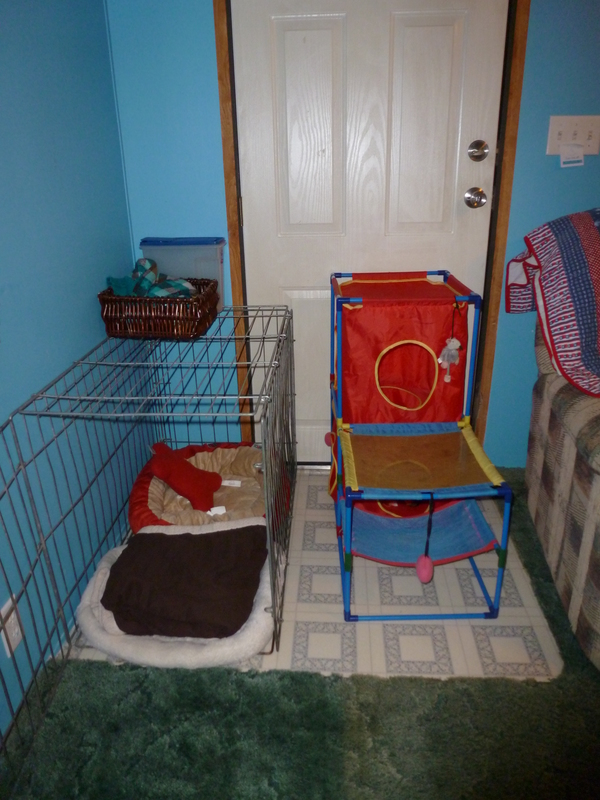 Also in the living room is our pet section – the dog’s items (crate, bedding – 4 items, wicker basket with 10 toys and a sweater and a container of dog treats.) and then the cat’s items (her tower and 14 small toys inside). 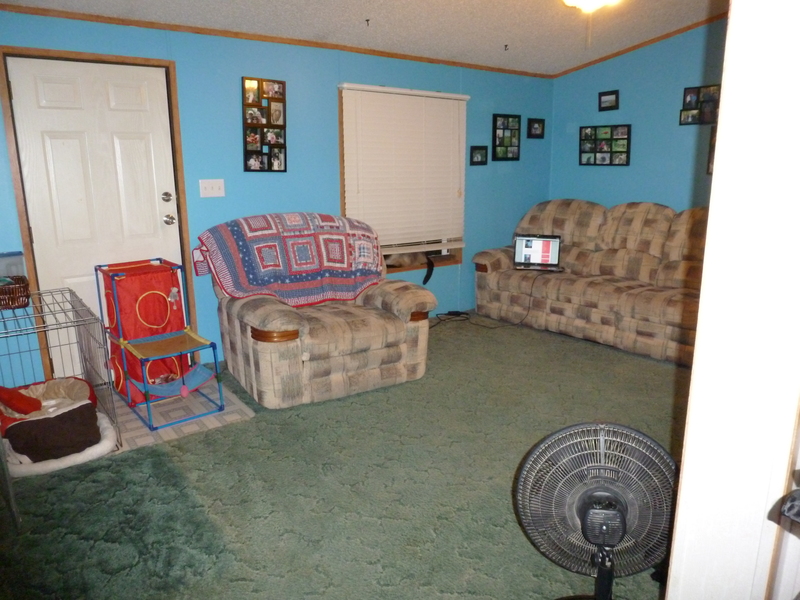 If you include the rotating fan and the quilt over the recliner it adds up quickly. Which adds up to 142 items total for one room. crazy isn’t it? I think what makes it not seem so bad is that 82 of these items pictured in the first photo and then 35 pictured in the second and these areas take up relatively little space in the largest room of our room. I hope you enjoyed a personal glance into my progress. No longer the living room of a hoarder. Look at all that floor space!!!!!!! 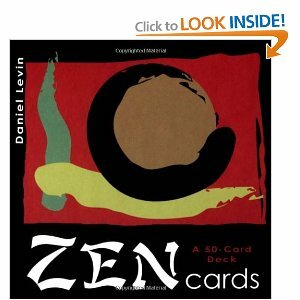 I recently found this set of 50 cards with zen like words with phrases on the back. in dance, no movement or direction is betterr or worse than another. This, too, is a way to view all of life. see all the “good and bad” things that happen to you simply as movements in the dance of life. today i received flowers at work from my husband. 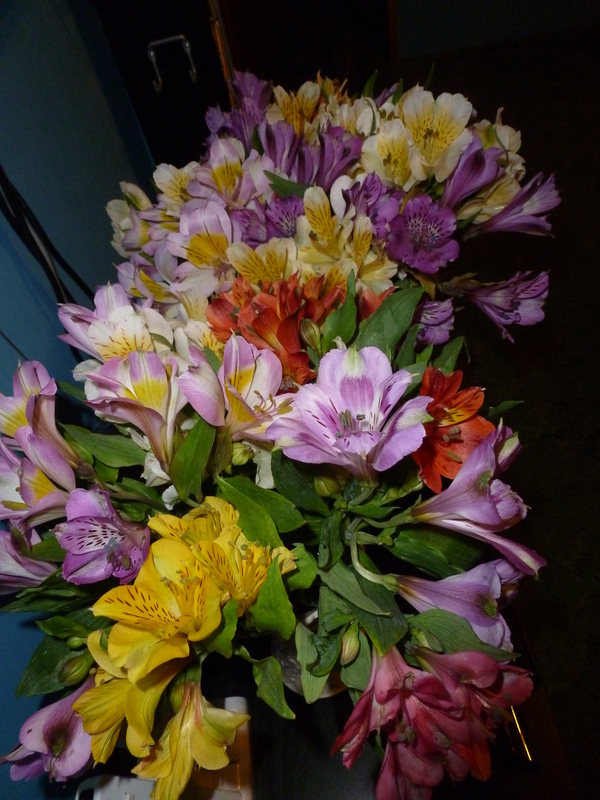 100 lilies for our anniversary. The buds are still really tight and the information stated it’ll take some time for them to open up so I’ll have a few days to enjoy these really lovely flowers. he is my sunshine – always knows the right gift to brighten my day. So I see a therapist for my ADHD and we have just starting working on my OCD. He wants to know what drives the compulsions and I feel silly and weak talking to him about them so mostly the response is “I don’t know”. He asked me what I do when I compulse and I talk about counting. I can’t fully verbalize the process because at this point I remember doing these things since I was a young child. It’s out of the thought range now and I just do them. Sometimes I don’t even realize that I’m doing them unless someone points them out to me. The other day I was really stressed out. I started to count. Certain numbers are good and certain numbers are bad. If I can count correctly then I will be “okay”. If I mess up the anxiety builds and then I start over. and over. and over. When the anxiety is really bad I touch things. every third block on the wall, posters, artwork, lines. reach out and touch. over. and over. and over. my stride has to be just right. I have tripped and stumbled before just so I don’t step down on a “bad” spot. There are certain actions that I’m aware of now that have become my “protectors”. I’ve been told that I’m stupid – by my father and then by the boy who abused me. The first 22 years of my life were filled with strong individuals who made it known that I was stupid and that I didn’t make sense. I know this is annoying but I really can’t help it. I’m always asking, “do you know what I mean?” “Do you understand?” “Am I making sense?” “You know?” It drives me nuts but I just can’t stop. Early on I had a major speech delay and was a terrible stutterer. My kindergarten teacher couldn’t understand a word I said. When we moved away from Philadelphia I was picked on horribly because of my speech impediment and my strong accent. Those scars don’t heal so well. Ever word I say I want to pull it back inside of me because I’m so terribly afraid of being judged or ridiculed even after all these years. My dad, when he was in a bad mood, would go crazy and do horrible, terrible things. I’ve seen him hurt my mom, my siblings, our pets… Horrible things that a child should never have to see. My emotional antenna is super sensitive because after all – I learned that when someone is having a bad day they HURT people especially those they “love”. Annoying action #2: I’m always asking, “Are you okay?” drives me nuts. I’m a rocker – not a cool ROCKER! but one of those people who when left to stand in a line or sit still for too long will start to rock and rock and rock. I’ll even rock myself to sleep. I hurt my back a couple of years ago and went to a chiropracter. I was rocking then. 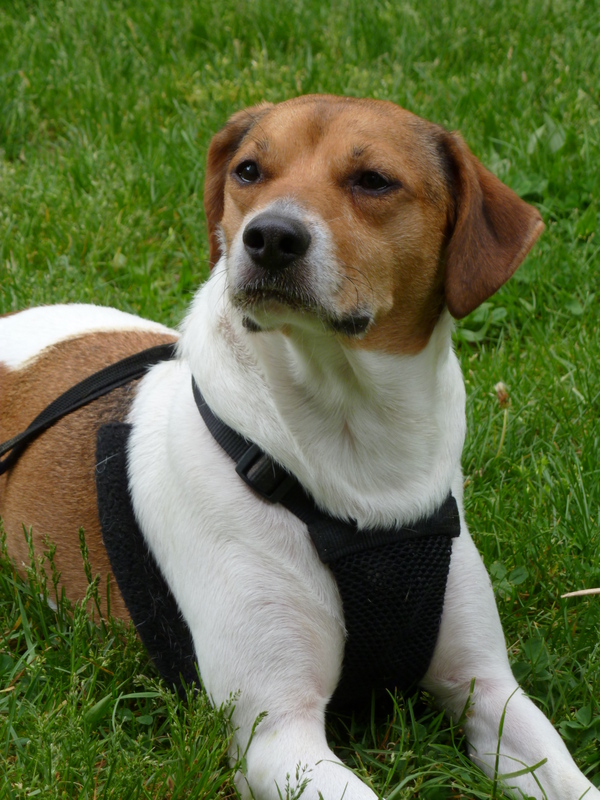 He explained to me that the rocking motion was a self-soothing mechanism to help ease pain. Profound statement for me – do I rock to soothe my emotional damage? Mommas rock their babies to soothe them. My mother was being abused and could barely take care of herself. Do I rock myself because I wasn’t able to be soothed by my parents? Who knows? I’m a scratcher, especially my head. When I am anxious my skin crawls. It’s such an unpleasant feeling, almost like bugs underneath my skin. I know there really isn’t any bugs but it’s almost like the anxiety just wants to come out and the scratching causes a physical release to the emotional discomfort. It’s like the hair pulling – it puts me into an almost meditative state. Pain then release. Depending on the trigger and the anxiety I can be a compulsive hand washer. I also abuse hand sanitizer. At one point in my life I would scrub with bleach because it was the only way that I could be clean. The hand sanitizer replaced the bleach because people don’t stare at you like your crazy if you’re using hand sanitizer but normal people don’t scrub with bleach. When you wash your hands too much they start to crack and burn. Hand sanitizer hurts really really bad but the fucked up part of your brain tells you that this is good because it’s killing the bad things. The sane part cries out that you are actually making things worse because you are washing too much and creating pathways for the germs to enter your body. When I met my husband and then moved in with him we went shopping together for household items. He put a gallon of bleach in the cart and I quickly removed it. We never owned bleach or scrub brushes for the first many years of living together because I couldn’t trust myself around them. I’m finally feeling healthy enough to own bleach again. It sits under my sink and I no longer use it for hygiene purposes but rather for the intended use. I’m always checking things. With ADHD I often forget things and OCD I’m always convinced that I’ve forgotten things. I’m smelling food, counting pieces, making sure things are where they are supposed to be, I’m making sure my daughter is okay, that the doors are locked. Always checking. I remember how I used to be so afraid, so very afraid that it would take me almost two hours to go to bed because I would need to keep getting up to check. doors, windows, etc. It would go something like this. Start in the farthest section of the house which was the big bathroom. Check in the shower to make sure no one was hiding there. check behind the bathroom door to make sure no one was hiding there. close the bathroom door so that no one could sneak around me and hide where I’ve already looked. check the big bedroom, under the bed, in the hope chest, in the closet, behind the door. check window, make sure it’s firmly locked. close closet, close bedroom door. check the back door, look closely to make sure it was locked, forget what it looks like when it’s locked. unlock it, lock it. still unsure. turn on outside light. look outside to see if anyone is hiding on the steps. open door. turn handle to make sure door is locked. close door. pull it tight. look in dryer. double check door. check kitchen window, make sure it’s firmly locked. look under table. make sure large bedroom door is still closed. check behind couch, check living room window, make sure it’s firmly locked. Check front door. Open door make sure screen door is locked. make sure dead bolt is locked. forget how the dead bolt looks when it’s locked so lock and unlock while staring to make sure the lock is secure. pull on door knob several times to make sure door is secure. check small bathroom to include in the shower and behind the door. check the other bedrooms, their windows and their closets. try to lay down and fall asleep while convincing myself that someone didn’t sneak around me to wait for me to sleep to hurt me. So it’s gotten easier to break these compulsions but certain things cause it to flare up a bit. Occasionally my husband will forget to lock the back door after he’s taken the dog out for the night. Once he forgot to turn off the stove. My daughter will occasionally forget to shut the door when she goes out to play or after she’s come inside from playing. That’s all it takes for me to start the process. Thankfully though it’s not been as bad as it was when I was younger. I’m not as afraid of the “monsters” anymore. Children fear monsters but for most their parents are loving, nurturing, stable and consistent. Monsters were very much real to me for most of my life. Monsters invaded every aspect of my life their their abuse and cruelty and they were supposed to love me. This is what domestic violence does to a child, then teen and finally young adult. Domestic violence makes monsters very real and very much alive. Back to counting. Counting to 100 is big for me. I also sort into piles of 10s and 100s. if i have 108 paper clips lets say, then I have to get rid of 8 so that it can be 100. Who am i kidding? I don’t own paper clips. they take too long to count. also unusable because if I use one then I no longer have 100 of them so I can’t stand having them around because then I have to purge down to a “good” number which means a multiple of 10. For a long time i only had 100 friends on facebook. I couldn’t add a good friend that I had found because it would change my number. If someone deleted me I would quickly have to friend someone so it could be 100. finally i convinced myself that this was no way to live and I’m proud to say is 131 which is not a “good” number but I’m okay with this. So I’m a tapper, a clicker and a very loud sigher. finger’s tapping, pen and tongue clicking. always in 3s. I’m also a compulsive eater and money spender. – when I’m stressed. When I’m really stressed I’ll swear. in appropriate places and spacees. I need constant reassurance. I always doubt myself. and I always need to repeat. repeating questions because I can’t remember the answer. rewriting lists to fix imperfections, redoing paperwork because it’s just not “right”.